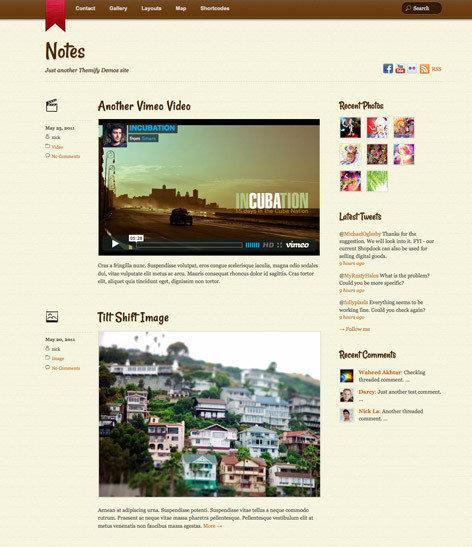 Notes is an awesome Wordpress Theme that allows you to post various post formats such as image, video, gallery, audio, quote, etc. like Tumblr blog. The theme design is inspired by the iPhone Notes app. It is a modern design theme with personal touches (light textured background and a bookmark ribbon). The layout is fluid and automatically adapted to any resolution on both desktop and mobile devices such as iPhone, iPad, Andriod, and Blackberry. Click here to see more features of Notes. Theme Control Panel – full control of your theme with our easy-to-use option panel from setting to styling. Themify is a WordPress Themes provider specializing in designing websites for Tumblr like websites. Themify WordPress Themes are unique, simple and easy to use.